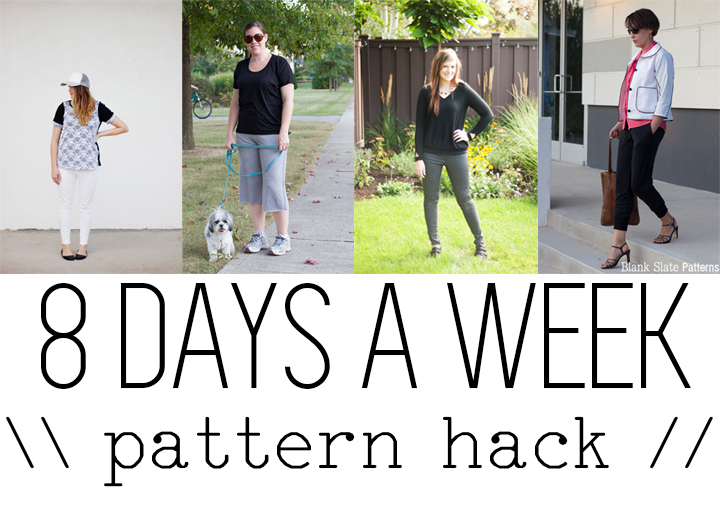 Hey y’all – today all of the Pattern Anthology designers are sharing some pattern hacks we’ve done. As if these patterns weren’t versatile enough, we’re giving you 4 more reasons you need to buy now! 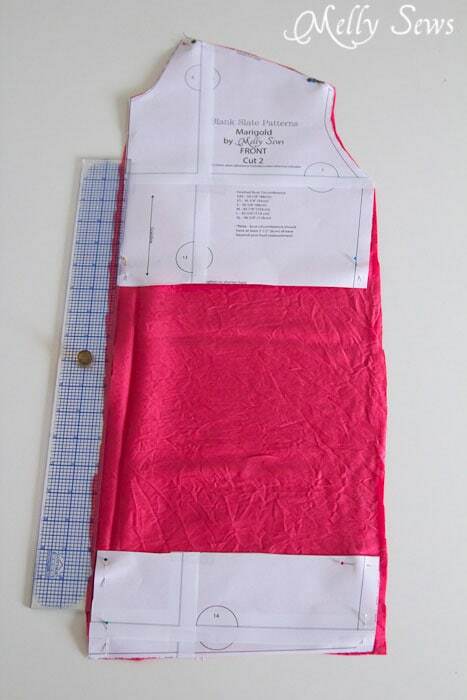 I’m showing you both how to lengthen bodices and how to turn a zippered jacket into a collared one. First, I used the Marigold pattern to make a washed silk blouse, with fabric I’ve been hoarding for over a year. You can buy the pattern for $12.95 with the buy button below. This is actually a super easy hack. All I did was cut the pattern on the lengthen/shorten line and add 8 inches. I also went straight down from the armscye instead of following the angle on the front bodice - if I had gone with the angle, this wouldn't have had the circumference necessary to go over my hips. 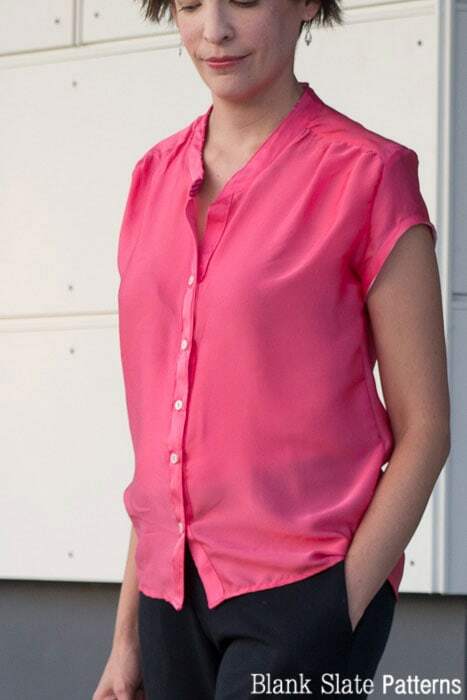 I followed the instructions in the pattern for the bodice and sleeves, and ended up with this watermelon blouse. Length - these pants also don't look like sweatpants because I shortened them (cutting at about knee level, then overlapping the pattern pieces) to ankle length. Then I pulled the cuffs up higher on my calves for that trendy slouchy look around the calf. Shoes - a pair of strappy heels also says this look isn't for the gym. Wedges would also work nicely. Follow the above tips and you too can wear pants that are as comfy as pajamas to work (and I totally would have worn this outfit to work when I was in the classroom). 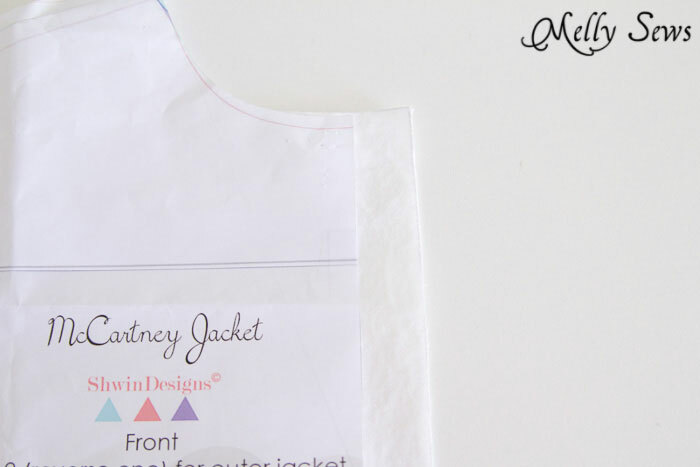 I also hacked the McCartney Jacket - I turned the zip front jacket into a cropped button up, adding piping to emphasize the style lines. 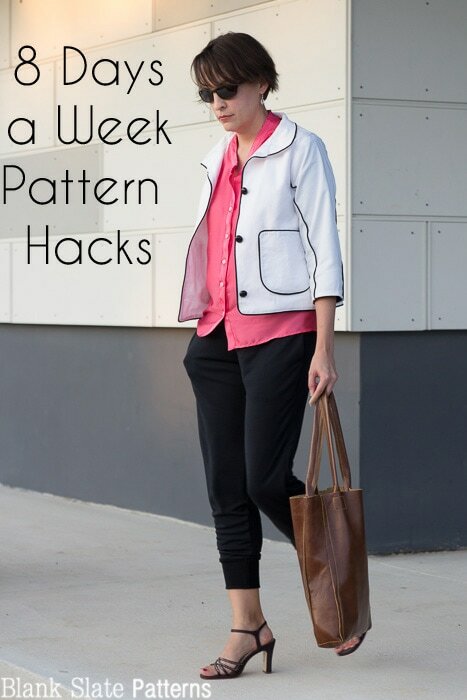 To replicate this pattern hack, you would add 1 inch to the top of the collar piece and 1 inch to the outer edge of the collar. Add the same 1 inch to the center front edge of the pattern. Omit the welt pockets and substitute rounded patch pockets. Omit the waistband and cuffs and shorten the sleeves by about 2 inches. 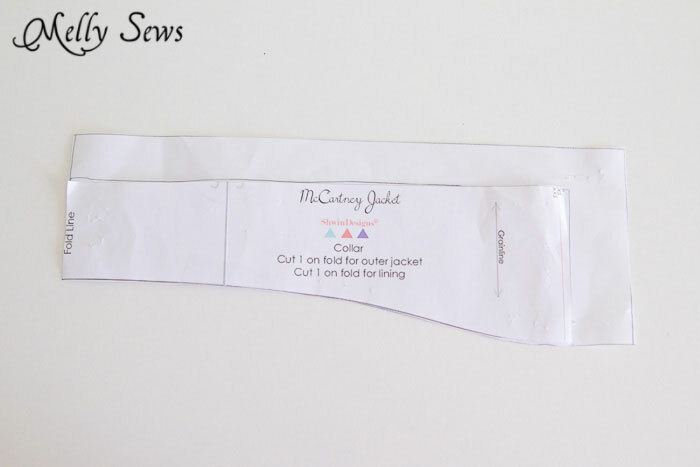 Then follow the pattern instructions to assemble the jacket, putting piping in the sleeve seams and in place of the zipper, and continuing the piping around the collar and lower hem edge. You can turn the jacket right side out by pulling the whole thing through a sleeve, then blind stitch the sleeve to the sleeve lining to hem it. Add buttonholes and buttons, and you've got a sophisticated crop. I used white twill to make sure this jacket kept its crisp shape. 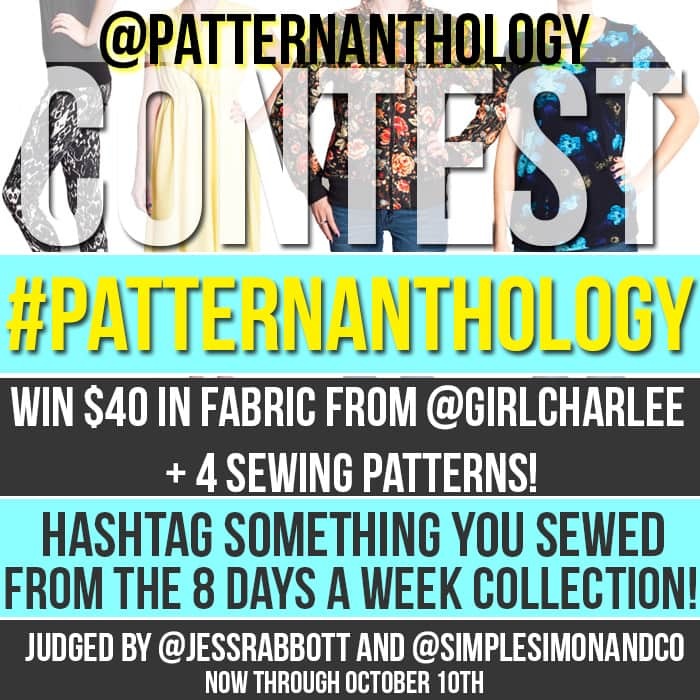 And one last thing - we've launched an Instagram sewing contest for 8 Days a Week. Details are below. And yes, I know not everyone's on Instagram, but for this contest, that's where it's at because it's the easiest way to share/view photos for this. Maybe next time will be in another format. Remember this collection is on sale for 40% off the individual retail price through October 6 only, so get yours now! Oh, love these hacks! I love that shirt a ton and the pants look so good that length! That blouse is beautiful! I was just thinking of hacking the Marigold into a blouse when I was getting dressed this morning. Now I’m totally going to do it. I love that color on you! Wow, all three pieces are gorgeous and I could see myself wearing them, you look like you’re channeling Audrey Hepburn in the photos, lovely work!